New Delhi: Former railways minister Lalu Prasad Yadav spent less than Rs1.5 lakh in winning from Saran, Bihar, in this year’s Lok Sabha polls. Union agriculture minister Sharad Pawar spent just Rs1.8 lakh to emerge victorious from Madha, Maharashtra, by a margin of more than 300,000 votes. This doesn’t mean that elections have suddenly become cheaper, said N. Bhaskar Rao, political analyst and chairman, Centre for Media Studies. Polls are “occasions when the bulk of unaccounted money enters the market. Some of the money may be coming from outside the financial system, he said. No candidate has ever been disqualified over election accounts," Rao said. “Recent reports on Maharashtra chief minister Ashok Chavan’s election expenditure" reflect this trend, he said. The NEW-ADR report, based on data received through a Right to Information application to the EC, shows that in none of the states did the average spending reach even half the expense limit. EC has set a ceiling of Rs25 lakh for each candidate in the larger states and Rs17 lakh for Andaman and Nicobar Islands, Arunachal Pradesh and Sikkim. The cap is Rs14 lakh for Chandigarh and Goa and Rs10 lakh for Dadar and Nagar Haveli, Daman and Diu and Lakshadweep. Of the 6,753 candidates who contested the polls, 1,266 (nearly one-fifth) have not filed expenses. They include members of all major parties—64 out of 421 from the Bahujan Samaj Party (BSP), 13 candidates out of 361 from the Bharatiya Janata Party (BJP) and seven out of 374 from the Congress. Only four candidates declared expenses in excess of the ceiling—Jaforulla Molla (Rs49 lakh) of the Assam United Democratic Front from Murshidabad-West Bengal, Prakash Jha (Rs45.27 lakh) of the Lok Janashakti Party from Paschim Champaran-Bihar, Raghuraj Singh Shakya (Rs41 lakh) of the Samajwadi Party (SP) from Fatehpur Sikri-UP, and Ramjilal Suman (Rs31 lakh) of the SP from Agra-UP. Thirty candidates declared spending more than 90% of the expense limit. 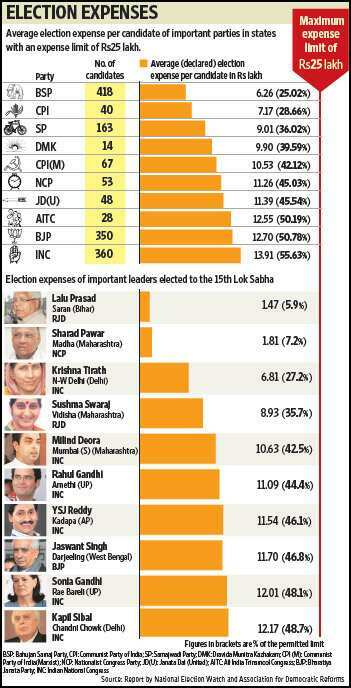 For candidates who declared assets above Rs5 crore, the declared average election spending was only Rs11.8 lakh. The average lowest spending was in the constituencies of Theni (Rs29,371) and Chennai North (Rs86,727) in Tamil Nadu, and Arrah (Rs1 lakh) in Bihar. Two independent candidates from Uttar Pradesh declared zero expenditure. ADR says the report exposes the hollowness of the demand by political parties to raise election expense limits. “This is not just the flouting of EC norms, it is a blatant violation of the very meaning of a free and fair election process," said Anil Bairwal, national coordinator of NEW and ADR. “It’s the first time that we attempted to reveal these facts. They are a clear comment on the system." In the national capital, the seven winning Congress candidates declared election expenses between Rs6.8 lakh and Rs20 lakh during the April-May general election. Given the near-blanket advertising, that doesn’t seem to square with prevailing rates. “A single bus stand advertisement in Delhi roughly costs around Rs1.5 lakh per week, even though there is a discount on political ads due to their quantum," he said, requesting anonymity as tariff rates are not supposed to be revealed. There is “always a chance" for understating accounts, Bharatiya Janata Party spokesperson Rajiv Pratap Rudy concedes. “Bills could have been understated by many candidates because many of them treat the whole exercise to be just a formality. But there is need for systemic rectification. Politicians alone cannot be blamed." Ishita Russell contributed to this story.